Diffusion Magnetic Resonance Imaging (MRI) is a powerful MRI modality which is sensitive to the random movement of the water molecules in biological tissues. By studying the anisotropy of this diffusion process in white matter it is possible to highlight structures otherwise invisible with other imaging modalities and to infer the neuronal wiring of the brain. This talk will focus on two key issues: the state-of-the-art ODF reconstruction using Tensor Distribution Function Framework and brain connectivity including the novel functional by the structure hierarchical (FSH) mapping. Liang Zhan received his M.S. degree in bioengineering at the National University of Singapore in 2007 and Ph.D. degrees in biomedical engineering from the University of California, Los Angeles, in 2011. 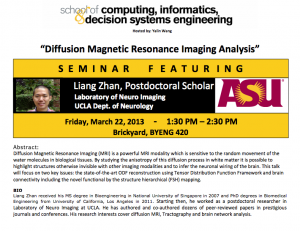 Starting then, he worked as a postdoctoral researcher in Laboratory of Neuro Imaging at UCLA. He has authored and co-authored dozens of peer-reviewed papers in prestigious journals and conferences. 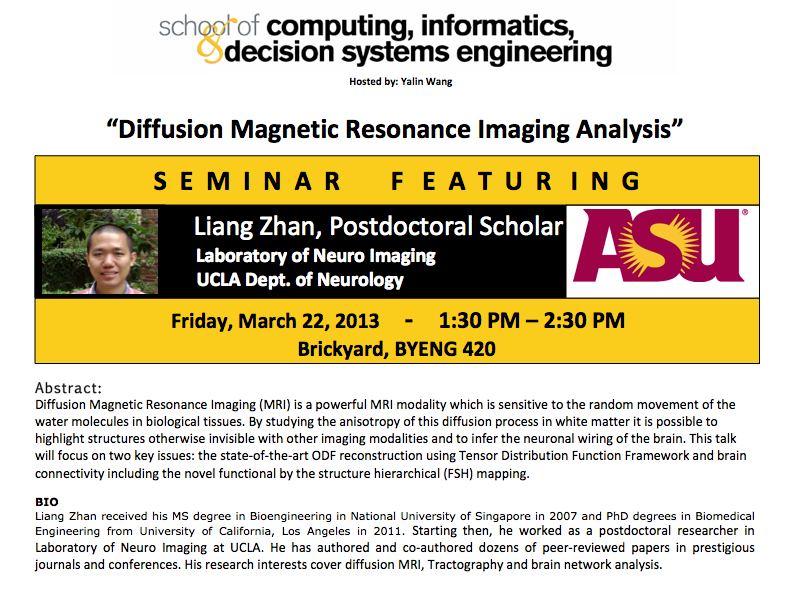 His research interests cover diffusion MRI, Tractography and brain network analysis. This School of Computing, Informatics, and Decision Systems Engineering seminar is hosted by Yalin Wang.